governance system for creating a hierarchy of product information that starts at the template level and goes down to different property sets and singular properties. It allows actors to organise the data they want to use in a robust structure, created through an industry-recognised best practice that is soon to become an ISO standard. Cobuilder Collaborate is a product used by clients and contractors to deliver validated and verified Asset Information Models. based on product types as well as their associated values, as set out in the project Asset Information Requirement (AIR) document. These requirements can then be allotted to the supply chain partners (via Cobuilder Deliver) so that they know exactly what data is required in which format and when it is should be delivered. Cobuilder Collaborate then provides the platform to collect their project’s data and automatically check and verify it. Finally, the collected and accurately checked as-built product data can be accessed and shared in common data formats (COBie, IFC,) and software (Revit, ARCHICAD, Navisworks). standards such as Eurocodes in the EU and BBA in the UK. Users will be able to use the same specifications on multiple projects and compare products and prices based on the same criteria as well as automate the purchasing process. 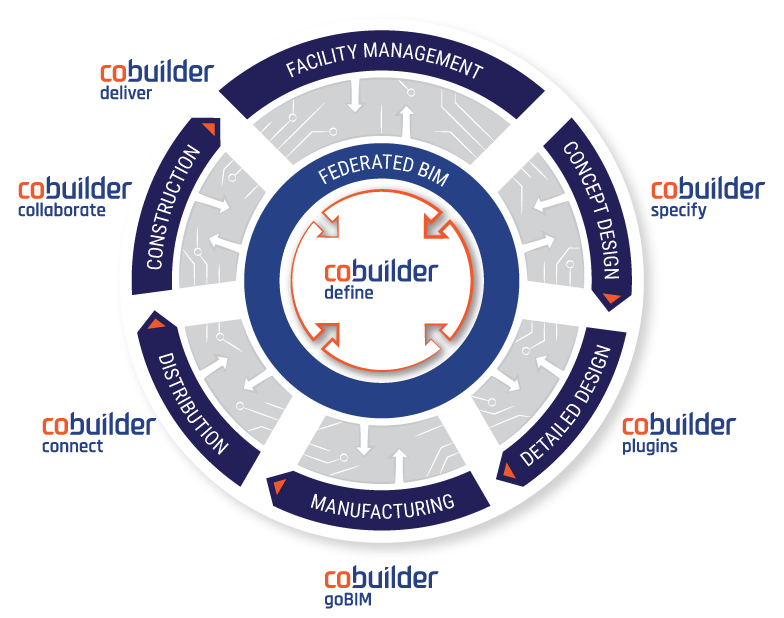 Through coBuilder‘s product goBIM, manufacturers can easily collect their data from a myriad of sources and structure it consistently via standard-based Product Data Templates (PDTs). legislation, national building regulations, European and national standards, ISO standards and market requirements such as BREEAM. This allows manufacturers to produce consistent data Product Data Sheets (PDSs) suited for different use cases so that the supply chain can receive exactly what is required within the correct context. This service allows construction industry actors to embed or link data and documents collected in Cobuilder data management software such as Cobuilder Collaborate to 3D models by using Cobuilder’s free Revit, ARCHICAD or Navisworks plugins. Collaborate and translates them to the user in an easy to manage interface. Then the supplier fills in the requirement template with the accurate as-built data and submits it for validation in Cobuilder Collaborate. The system automatically notifies the user if data is missing or is incorrect.